So, I should start this discussion of potato salad with bacon and parsley by admitting that I am not the world’s biggest potato salad fan. Frankly, if I am going to spend my carbs on a side dish, I like it to involve pasta or rice or even corn. And those potato salads with sour cream and mayo — well, they are just a little heavy for me. But every once in a while I run across a new recipe that compels me to try another potato salad recipe in the hopes of finding one that I really like. And this one…I really like! Adorable baby potatoes, fresh parsley and, of course, BACON. It was a potato salad that had me at hello…let’s make it! …and you can use all red, all yellow or a mixture. Just try for the smallest ones you can find, for nice bite-sized potato salad wonderfulness. This used to be not such an issue when we had Wilbur. 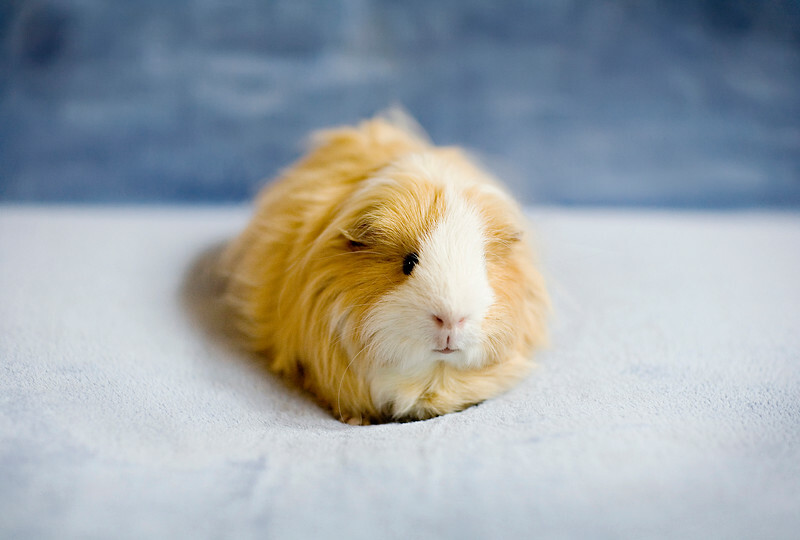 Wilbur was our guinea pig, and he didn’t have a lot of personality — he was pretty much a baked potato with fur — but man, he loved a good plate of basil and parsley, and could always be counted on to chow it down. Wilbur broke all world records for life expectancy, but is now chomping herbs in guinea pig heaven. We miss the old guy, actually more than I thought we would. Good old Wilbur. But I digress. Last but not least, this potato salad also includes bacon, and need I say more about THAT? All of this dressed with a light mustard vinaigrette, and it is ready in two shakes. The longest part of this is the 15 minutes you spend boiling the potatoes — it really couldn’t be easier. So here you go, a recipe for a potato salad that I actually LIKE. (Because I know you were worrying about that). 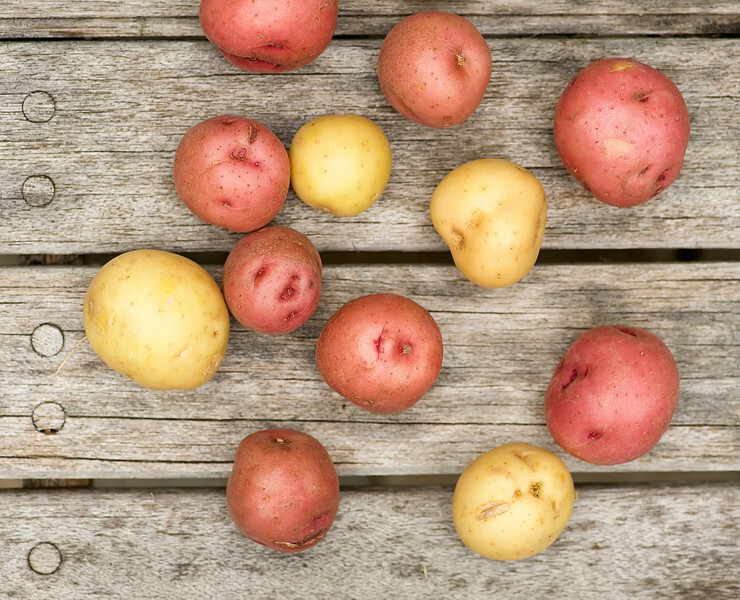 Put the potatoes in a pot with water to cover and one teaspoon salt and simmer until tender, 15-20 minutes. Drain and run under cold water. Cut into quarters. While potatoes are cooking, cook the bacon in a skillet over medium-high heat until crisp, 6-8 minutes. Drain on paper towels and crumble when cool. In a large bowl, mix oil, vinegar, mustard, 3/4 teaspoon salt and 1/4 teaspoon pepper. 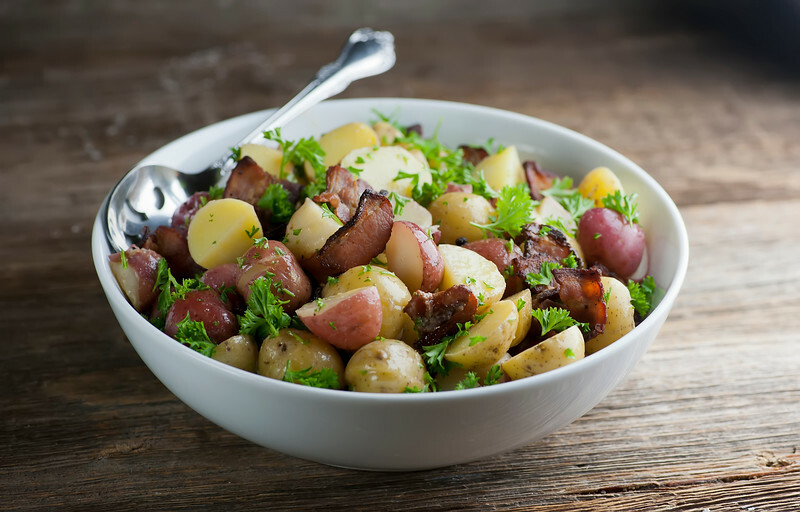 Toss with potatoes, bacon and parsley. always looking for a good potato salad recipe! thanks. I made this with cilantro instead of parsley, since I was out of parsley. It was yum! BUT I had some leftover and for breakfast the next morning, I made hashbrowns out of it! The bacon crisped up, the flavor came out even more from the dressing and it was delish! Thanks for sharing such a easy and tasty dish Kate! I sliced my potatoes instead of doing them in quarters, but I think it would work equally well for hash browns either way. Finally, another human who doesn’t get on board the typical potato salad train. THIS, however, sounds delish. My sister makes one that’s similar and I love it. I also love me a good German potato salad. Bacon is also involved, so ya know…..
OMG, guinea pigs! A memory from my childhood just floated past…the part of the family that “we don’t talk about” came to visit when I was maybe five or six. They were travelling the country in an old school bus — the kind that were bright yellow and had a snout, only theirs was painted rather decoratively. And they raised guinea pigs. OMG! There were so many cages and little critters running loose in their home that I don’t know how they found a place to lie down and sleep! 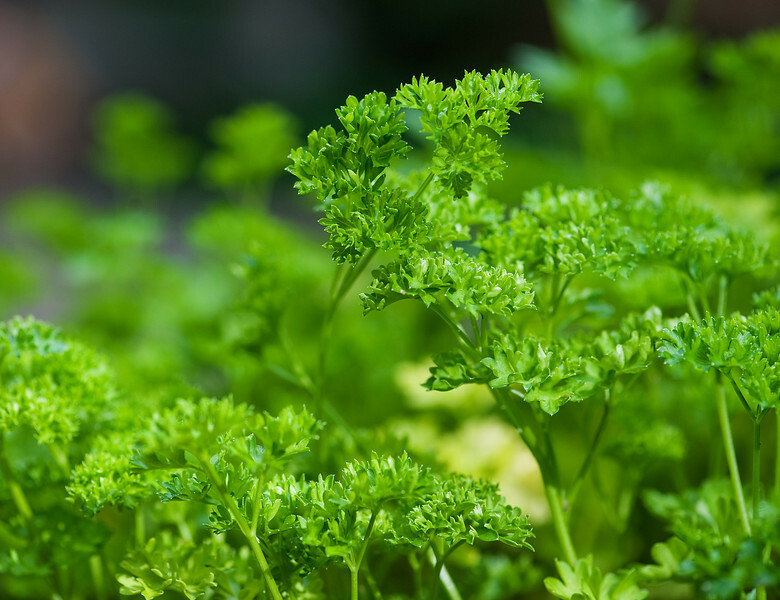 I remember my little brother in kindergarten loving the story of Humm the Hamster who loooooved parsley. Did you ever read that book? I’ll be trying this potato salad recipe soon. Oh, Wilbur! So cute. That takes me back to some Guinea pig memories! I ate a lot of heavy potato salad at gatherings when I was a kid, so I always prefer non-mayo based now. This is so fresh and summery. And BACON!! ???? Guinea pigs are the best – we did love our Wilbur! Happy long weekend, Amanda! Little Wilbur! OMG he looked adorable! Love this potato salad Kate. Bacon makes everything better! And love the light mustard vinaigrette. Have a great week! I’m actually not the biggest fan of potato salads either, mainly because they’re made with miracle whip! But this version sounds delicious, Kate! I love the bacon and parsley in here, too. Perfect for summer! You and I clearly have similar Miracle Whip issues! Happy long weekend, Gayle! I’m not big into potato salad either, but this one looks like an outlier! I would totally face plant into this! I used to have a guinea pig named Muffin. She lived 11 years (which is insane) and I think it was out of spite. She really hated me for some reason, maybe all that cage cleaning. :) So having personality is not always a good thing! Muffin!!! And yes, all the cage cleaning…which was supposed to be my daughter’s job, but somehow it turned into mine. Hmm. Bacon Princess – I smile such a big smile whenever you call me that! xoxo! Wilbur is romping through the sparsely in guinea pig heaven, I am totally sure of that! Have a wonderful, restful long weekend my dear – xoxo! Wilbur had a great life! And yes, this is one of my favorite picnic take-along dishes! Love potato in any form and this one looks so healthy and flavorful. Loved it! It’s got the best flavors – I think because the lighter dressing lets them shine through. Yay potato! This looks fantastic! I love that it doesn’t take too long and the potatoes don’t have to be peeled.